I was invited to go and watch a cutting horse competition that my friend was participating in. I hadn’t been to a cutting competition in a long time so I decided to go plus I wanted to see her compete. If you’ve never seen a cutting horse work you should go and watch one perform at least once, those horses are such athletes. I love watching the horse as they head towards the herd they perk up and are so focused on watching the cows. The rider takes the horse deep into the herd and brings some of them out, and as soon as they have the cows narrowed down to two or three they then pick the one they will work. As soon as the rider locks the horse onto the cow it’s all business. That horse goes to town doing their best to keep the cow from getting back to the herd their eyes are locked on, the ears intently listening and their breathing becomes faster and faster. Working the cow they will sometimes get so low to the ground the riders feet could easily make contact with the dirt. They give me goosebumps when they get down low like this and then go back and forth working that cow. Can you imagine having all the controlled power under you? These riders and horses make it look so easy, but there’s a lot to training one for competition plus the rider has to develop their seat so they can stay in the saddle. Now the majority of these horses are born with cow sense because that is what they were bred for, but some even though they have this breeding don’t like the job of being a cow horse. Horses with this type of breeding still need training so they know what to do when working cows and what the rider is asking of them. At this event I had the opportunity to see the riders warming up their horses in the outside arena and also saw those loping their horses in the back part of the show arena. It saddened me to see some of the riders and trainers just drill their horse into the ground on the same thing and the entire time they were jerking and spurring the horse. Some also have what is called a head setter on their horse. When I asked why the head setter was used the answer was that it teaches the horse to keep their head down. That is not training that is forcing the horse into a position which is wrong. There is a better way and I can show you how it can be done and your horse will be happy to do so! When I see people putting things like this on their horse it tells me they don’t know how to properly train a horse to keep their head down. It was disgusting to see the riders and trainers that used this gadget so their horse could not throw their head up when they were spurring and jerking on them relentlessly. The other thing I saw that really disgusted me was when one of the top trainers (so I was told) got off of his horse and hit it in the side of the head then he started jerking on the reins. Now mind you this horse had a bit in it’s mouth. Can you imagine how painful that was for the horse? He then took his chaps off threw them over the saddle and then promptly removed the bell boots from his horse. After removing the bell boots he then went to leave the arena, but as he started walking off he missed the reins. When he realized he missed the reins he picked them up and started jerking on the reins again like it was the horses fault. People like this don’t deserve horses, what a jerk! Now it’s my understanding that this type of behavior is not allowed and people can get fined for doing this, but nothing happened to any of these people. Why? Because people are afraid of the retaliation they would get from turning them in. I’m appalled that the association, show officials and others allow these types of things to be done to the horses, but really it doesn’t surprise me because it’s all about the money and not about the horse. The other thing that goes on which is really unfair is when any of the four turn back riders don’t do their job to help the person who is working the cows. The job of the turn back rider is to either help keep the cow from getting back to the herd or help keep the cow in the middle, but if they don’t like you or don’t want you to win they just sit there and let your cow go by. I’ve seen this happen twice now to my friend and it’s so unfair but you know what these people will get what’s coming to them. I believe in karma and you know what they say about paybacks. I know if I go again I will be video taping people that do things like this to their horse. Don’t be silent we need to stand up for the horses and be a voice for them. I would love the opportunity to train one of these horses with my methods and if I ever get a chance I will show it can be done without using force, fear or intimidation! **The photo used in this blog post does not represent any of the people at the cutting I went to. 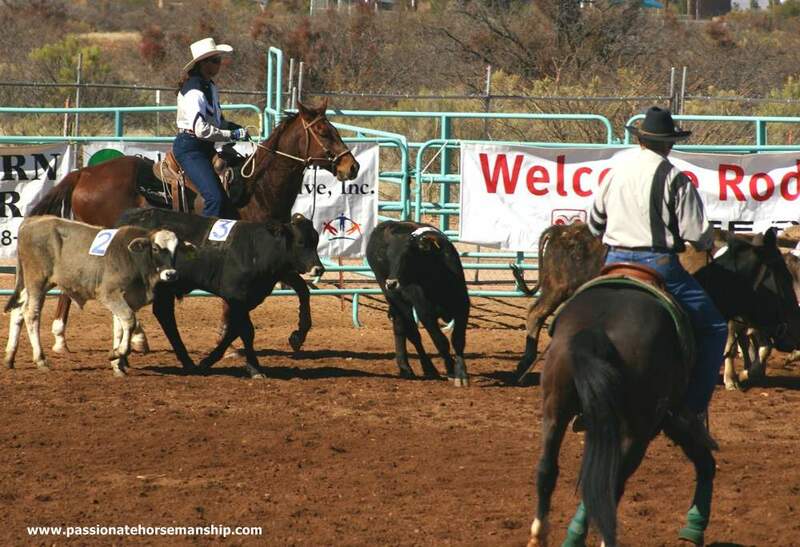 So have you ever been to a cutting horse event? What did you think?